i. Izak Johannes Otto, geb. 28/10/1910, ged. 11/12/1910, Uniondale, oorl. 26/04/1979, Oudtshoorn x Anna Aletta NN, geb. 02/02/1929, oorl. 03/04/2014, Oudtshoorn. 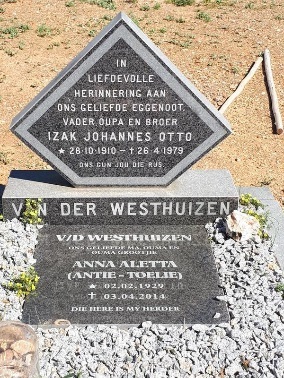 Izak Johannes Otto was die seun van Johannes Stephanus Otto van der Westhuizen en Catharina Elizabeth van der Spuy. Source: Nederduitse Gereformeerde Kerk, Uniondale (NGK), Uniondale, Baptism register, 1866-1920, entry number 52. Repository: Uniondale NGK Church. Transcribed by Carol Beneke, from photographs of the register taken by Mechelle Beneke at the church.